Vendors may restock booths during the one (1) hour period before the above stated show hours. Security will be provided beginning at 5:00 PM Thursday, July 10th through Saturday, July12th . Vendors are encouraged to remove their merchandise on Saturday night. All outside Vendors must furnish their own booth. To issue two (2) Vendor parking passes per booth (additional parking passes may be purchased from the Vendor Managers). BIG TEX BBQ FEST, its officers, directors, agents or volunteers will not be held responsible for the theft or loss of any article. BIG TEX BBQ FEST reserves the right to relocate Vendors for the maximum benefit of the association and its visitors. Booths must be occupied by a single business only. Vendors representing different business may not share booth space. To have booths staffed during show hours. All taxes are the sole responsibility of the Vendor. To provide proof of current General Liability insurance naming the City of Pasadena, The Big Tex BBQ Fest its officers, directors, agents and volunteers as Additional Insured. Agrees to pay $40.00 for one electrical outlet up to 10 amps. Additional service may be purchased by contacting the Vendor Managers. There will be an extra charge for 220v service. To be responsible for all extension cords and adapters. To use no more than the allotted space. Vendors found using more than their allotted space will be charged for an extra booth. There are absolutely NO outside sales allowed. Ice, carbonated beverages, and bottled water will be sold by the The Big Tex BBQ Fest. Vendor will not be allowed to bring in ANY ice, carbonated beverages or bottled water. Coffee, tea, lemonade, etc. will be allowed to be sold in Vendor booths. No refunds, no cancellations, NO EXCEPTIONS. Vendor assumes complete liability for all occurrences within the booth space or with immediate customers. Vendor agrees NOT to sell any alcoholic beverages. Vendor agrees NOT to sell any T-shirts, caps and/or any item bearing the Big Tex BBQ Fest logos, furthermore Vendor agrees not to sell any item that Big Tex BBQ Fest or the public might find offensive. Guns, knives, tasers or any other weapons of any kind may not be sold. Vendor agrees to provide any tables, chairs or other display material, which may be needed. 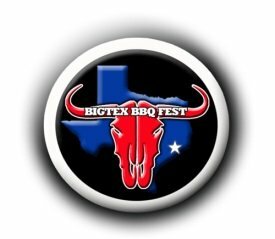 Rental items (tables and chairs) will NOT be available from the Big Tex BBQ Fest. Vendors understand that there will be entertainment inside and outside and there will be some noise from these events. The purpose of these events is to build traffic to the Vendor booths. Excessive noise by the Vendors is not permitted. This contract shall not become effective until accepted by the Big Tex BBQ Fest. There will be no changes or additions after this agreement has been approved by an agent of The Big Tex BBQ Fest. Vendor will provide his/her own trashcans and clean up inside his/her own booth space daily. Vendor will pay for all Workman’s Compensation, FICA or withholding taxes for any and all employees or agents that work in their booths. The Big Tex is a 3 day Cook Off and Music Festival. Top Pitmasters from around the country will compete to win 10,000 and a customized pit by JJ. The festival grounds includes live music concerts with top headliners, a special veterans salute, kids zone, Beauty pageant, and amazing BBQ the whole time! !